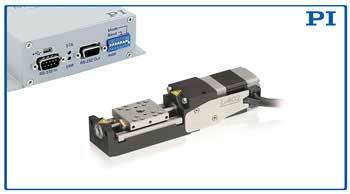 (Nanowerk News) The L-402 compact linear stage is the newest addition to the suite of motion control solutions available from precision positioning systems industry leader PI (Physik Instrumente). Delivering performance and reliability at minimized cost, this affordable miniature linear positioner is well-suited for micromanipulation, test systems, and opto-mechanical alignment automation applications. NEW Mini Linear Stage, L-402, shown with PI’s Mercury Servo Controller. With a travel range of 1/2” (13mm) and velocity to 0.2”/second (5mm/sec), the L-402 delivers high accuracy and smooth motion for loads up to 1lb with minimum incremental motion and repeatability down to 0.5 microns. The closed-loop version provides encoder resolution of 0.12 microns. Long service life and excellent guiding accuracy with minimum backlash are guaranteed by creep-free crossed roller bearings. The clever stage design allows for XY and XYZ stack configurations without the need for adapter plates. For vacuum-applications, special versions to 10-6 hPa are available. Which Motor Do You Need? The stage comes with the choice of two direct-drive motors, a DC servo motor with closed-loop encoder and 2-phase stepper motor. Other encoder options for OEMs are also available. Noncontact, optical limit switches and reference point switches with direction sensing in the middle of the travel range simplify use in automation tasks. PI is a leading manufacturer of precision motion control equipment, piezo motors, air bearing stages and hexapod parallel-kinematics for semiconductor applications, photonics, bio-nano-technology and medical engineering. PI has been developing and manufacturing standard & custom precision products with piezoceramic and electromagnetic drives for 4 decades. The company has been ISO 9001 certified since 1994 and provides innovative, high-quality solutions for OEM and research. PI is present worldwide with twelve subsidiaries, R&D / engineering on 3 continents, and total staff of 950+.